This essay was adapted from “LEAP Dialogues: Career Pathways in Design for Social Innovation” as an introduction for 10 case studies that were part of the book which focused on the changing role of design and designers in society and the marketplace. The book was edited by Mariana Amatullo, Bryan Boyer, Liz Danzico and me, and it features 84 designers, educators and thought-leaders from across the United States who examine why these changes are happening, what is needed to support these new practices, and how designers can pursue these emerging career pathways. Learn more about the book and download for free The LEAP Dialogues: Educator’s Guide. Download the case study template described below. When does the impact of a social impact project end? In the fall of 2009, William Drenttel—a member of the original LEAP Symposium Braintrust—spoke about this topic at an early morning session of the Better World by Design conference. He cited examples of organizations like Teach for America and Project M, whose legacy continues to grow as their former members apply the expertise they gained in their future work. Drenttel called this “design over time,” and he challenged us to continue looking for ways inspire other designers to work as social innovators. One way we can do this is by capturing “the learning and knowledge” of a project and then compiling its important details and unexpected nuances into case studies that can be shared. Drenttel’s conviction that case studies should be a common outcome of every project and that we should disseminate them widely will resonate with social impact designers who look for ways to make transformative work. Case studies are one of the most important tools that can help designers at any stage of their career, by pairing their existing design abilities with the wisdom of those who navigated complex projects. The majority of LEAP Dialogues is filled with conversations between designers who elaborate on some of those experiences, but this section highlights actual projects. We identified 10 of these projects from design studios, consultancies, and organizations that regularly work on a range of impact-focused design initiatives. The details of projects like these are often a mystery to those emerging designers who admire what appears to be a seamless navigation from messy complexities to simplified solution. To capture the insights of these projects, we provided each contributor with a case study template and asked them to tell us the story of their project. The template’s structure shadows the design process itself, so anyone can easily trace how the designers steered through their project. And like any good template, this one allows contributors to customize it to meet the needs of their project. While some stuck very close to the structure, others blended sections, added or skipped categories, and answered certain sections with greater attention. Nevertheless, all of the projects follow three main sections: project details, design process, and reflections—each of which includes several subsections. The first section, Project Details, helps readers to quickly engage with the project by providing a summary overview and various logistical details like where the project took place, when it was completed, and the audience or community being served. Next, Design Process, provides space for contributors to dive more deeply into the project details, starting with the baseline information, or what they knew at the start of the project. They then describe their design solution that includes descriptions of graphics, products, structures, service blueprints, or any other summary of their iterative design process, along with implemented details. Contributors concluded this section of the template by assessing the impact of their project, whether that be social, economic, environmental, health, educational, cultural, political, or falls into some other category. The final section, Reflections, of the template provides a space for contributors to be candid about the project while addressing some of the foundational themes found this book: why the designer worked on the project, what tools, methods or frameworks they utilized, and how other designers might get involved in this kind of project. Altogether, this collection looks past the polish of portfolios and deep into the process of designers working on some puzzling challenges. Three of the case studies take place in the United States, including one from the Center for Urban Pedagogy that focused on rezoning, which has radically reshaped neighborhoods in NYC, but few of us understand. In Chicago, Greater Good Studio shares their approach to helping incarcerated youths rebound at the crucial time when they transition from their time spent in juvenile homes. The New Orleans iTeam focuses on reducing the high number (52%) of unemployed or underemployed African-American men. Though this team included no designers, they saw the benefits of applying human-center design methodologies throughout their process and, as a result, the new iTeams include designers in order to ensure that design expertise is more deeply ingrained in the strategies. Another four case studies feature projects that took place in different parts of the world, including ideo.org’s integrated social enterprise that provides health, water, nutrition and agriculture services to rural, displaced communities in eastern Congo. In Haiti, MASS Design Group’s state-of-the-art hospital reduces the chance of in-hospital tuberculosis transmission while increasing the comfort and dignity of patients who undergo long-term treatment. Catapult’s modern hand washing station for Western Kenya improves hand hygiene by addressing the barriers that deter people from washing their hands while encouraging consistent handwashing behavior. In Myanmar, Proximity Design engineered a vastly more affordable irrigation pump that is solar powered and easy for farmers to use with existing infrastructure. The three remaining case studies focus not on any specific geographic area but can be utilized throughout the world. The first of these projects, by frog, is a platform that makes humanitarian data easy to find, use, analyze and share, and supports the coordinated efforts to relieve human suffering anywhere around the globe. D-Rev focused on helping the 5% to 15% of amputees in developing countries who have access to the care they need by developing a low-cost, polycentric knee for amputees who live in resource-limited parts of the world. Lastly, IBM Design focused their attention internally, to help their own designers who work in offices around the world become more responsive to the needs of all people by applying accessibility principles in their work. While the projects included within the book originate from design studios and organizations, the same kind of documentation can take place in design courses. Students who reflect on their semester-long design projects by documenting them as case studies will not only better understand the value of their efforts but will also educate future students who iterate on the projects in future courses. Here are some case studies from courses I have taught at various schools, including Parsons School of Design, Pratt Institute, and New York City College of Technology (CUNY). The differences between all of these projects do not overshadow what they have common, which shows the field maturing into a movement that shares many core values: empathy, co-creation, inclusion, accessibility, and equality, among others. Another value, transparency, is one that Drenttel prioritized in his talk in Providence, and one that we can easily start putting into practice by documenting, compiling, and sharing the successes and shortcomings of our projects. 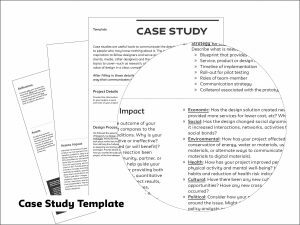 Download the case study template that LEAP contributors used and tell the story of your work, so future generations of designers might become social innovators, giving the dialogues that LEAP has started greater value over time. Andrew Shea is principal of the studio MANY Design and is Assistant Professor and Associate Director of Integrated Design at Parsons School of Design. He wrote the book Designing for Social Change: Strategies for Community-Based Design and was an editor of LEAP Dialogues: Career Pathways in Design for Social Innovation. His design and writing have been featured by Design Observer, Fast Company, Slate, 99 Percent Invisible, Core77, and Print, among others.